First there was the Photowalk. Next up was the competition. Then came the calendar, and now there are the exhibits. Starting Feb. 11, photography exhibits will open in Asia, Europe and North America to showcase images from the first Global Particle Physics Photowalk. Exhibits will open on Feb. 11 at CERN in Switzerland, Fermilab in Illinois and KEK in Japan. Photowalk exhibits will also open in Canada at TRIUMF on Feb. 21 and in Germany, organized by DESY, within the next year. The Photowalk took place on Aug. 7, 2010. More than 200 amateur photographers received special behind-the-scenes access to tour scientific facilities at CERN, DESY, Fermilab, KEK and TRIUMF. The participating photographers submitted thousands of photos for local and global competitions. Each photowalk exhibit includes the local winners from that particular laboratory's competition. 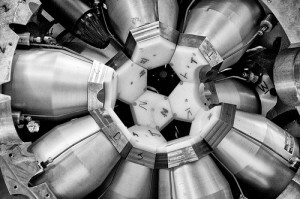 All five Photowalk exhibits feature the two global winners, Mikey Enriquez's photograph of the 8Pi experiment at TRIUMF and Hans-Peter Hildebrandt's photograph of a wire chamber at DESY. The InterAction Collaboration, whose members represent particle physics laboratories in Asia, North America and Europe, organized the Photowalk. The collaboration plans to host the next Photowalk in 2012.